The Nokia 8 Smartphone, with a case milled from a block of aluminum, includes a 5.3-inch quad HD display and a Qualcomm 835 octa-core processor will be launched in September. 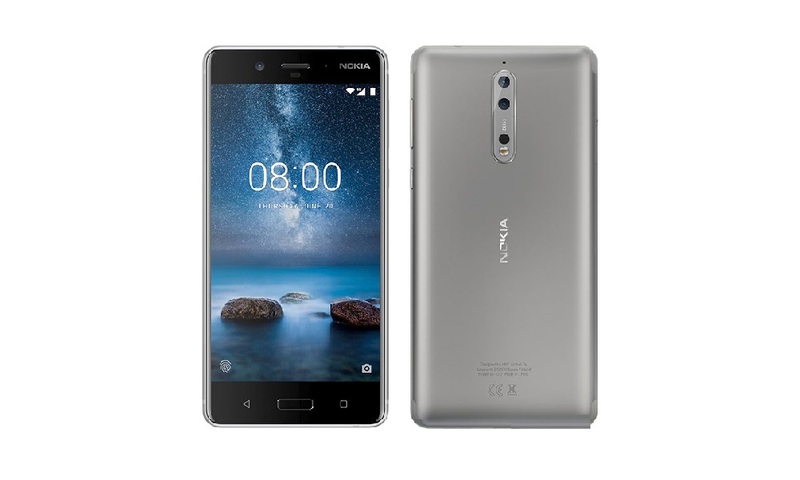 The latest flagship Nokia smartphone, the Nokia 8, will begin rolling out around the world in September, featuring a 5.3-inch quad HD LCD touch-screen display, 4GB of memory, Zeiss optics and a Qualcomm Snapdragon 835 octa-core processor. The new handset, which is being distributed by HMD Global under a 10-year licensing agreement reached in 2016, will sell for an average of $705 around the world, according to an Aug. 16 announcement by the company. The body of the phone is milled from a single block of aluminum, which undergoes a 40-stage process of machining, anodizing and polishing, according to HMD. Also included in the phone is a Corning Gorilla Glass 5 display cover, 64GB of built-in flash storage, a microSD card slot supporting cards up to 256GB, dual 13-megapixel auto-focus main cameras—one for color and the other for black and white images—as well as a 13-megapixel front-facing auto-focus camera. Both cameras feature Zeiss optics. Also included is Nokia OZO Audio, which brings immersive, spatial 360-degree audio to 4K video captured by the handset. The Nokia 8 runs the Android Nougat 7.1.1 operating system and meets IP54 standards for dust and moisture resistance. The handset also includes a USB Type C socket, a 3.5mm headphone jack, a fingerprint sensor and is Qualcomm Quick Charge 3.0 compatible. The smartphone, which will operate on GSM or CDMA cellular networks, also includes 802.11 a/b/g/n/ac (MIMO) WiFi, Bluetooth 5.0 and Near-Field Communication connectivity options. The phone is 5.96 inches long, 2.90 inches wide, 0.31 inches thick and weighs 5.64 ounces. Slated to be available in four colors—Polished Blue, Polished Copper, Tempered Blue or Steel— the Nokia 8 will be sold around the world. However HMD hasn't disclosed when the handset will go on sale in the U.S.
HMD Global's licensing deal for Nokia phones was announced in May of 2016 and includes the rights to develop, build, distribute and market Nokia-branded smartphones. Third-party manufacturers build the phones for HMD using the Nokia nameplate. After being a major player in the global mobile phone business for years, Nokia fell behind competitors Apple, Samsung and others in the past decade and eventually sold its phone business to Microsoft in September 2014 for $7.1 billion. In June of 2015, less than a year after the sale of its phone business to Microsoft, the original Nokia announced that it would license its phone designs to third-party manufacturers for production and distribution, setting the stage for the HMD deal in 2016. After selling its mobile handset business to Microsoft, Nokia has continued to operate its telecommunications equipment and navigational software units under the Nokia brand.